Cabasse launches Surf speakers to partner StreamAMP | What Hi-Fi? The Surf speakers complement the StreamAMP’s compact design, and take components used in Cabasse’s flagship speaker ranges. Sitting at 29cm tall, the Surf speakers fall into the compact category. Cabasse says they are ideally suited for rooms up to 25sq m (270sq ft) and deliver a soundstage that is “incredibly stable and filled with realism”. 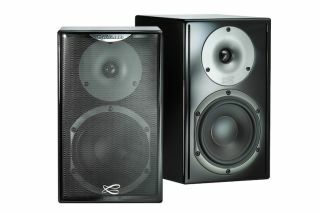 If used with the StreamAMP, the speakers are capable of reproducing low frequencies down to 65Hz, and highs up to 23kHz. Surf speakers are fitted with a tweeter diaphragm used in the flagship La Sphère and L’Océan models, which Cabasse says allows them to produce “the sound quality heard on the best products”, as it has “a remarkable damping capacity and extreme thermal and mechanical resistance”. The 13cm driver is fitted with a high-excursion woofer said to have “maximum mechanical rigidity and low frequency use” which allows it to have “deeper bass without colouration”. The Digital Enhancement of Acoustic Performance (DEAP) DSP technology in the AMP allows users to tell the system which Cabasse speakers are being used, and where they’re placed in the room to help calibrate the best sound possible. Christophe Cabasse, marketing and sales director says, “The Surf speaker brings a whole range of benefits to the users, because for such a compact speaker it is capable of producing a similar sound quality to that heard on much larger products. "The generous frequency range from this bookshelf speaker and the DSP capability of the Stream AMP allow the purest possible sound when streaming from the network or internet." The Cabasse Surf speakers are available now in glossy black or white for £379.